ORLANDO, Fla. — The difficulty of finding truck parking is pushing drivers out of the business and contributing to the industry’s persistent driver shortage, according to experts who spoke at the Natso annual convention, held here Feb. 10-13. American Transportation Research Institute Vice President of Research Dan Murray said his organization’s research shows the average driver spends 56 minutes a day looking for parking. Natso CEO Lisa Mullings said incentives are needed to encourage the truck stop industry to make more parking available, and if drivers need to pay to reserve a spot, that is a better option than spending nearly an hour a day looking for free spots or parking unsafely on ramps or other locations. “I can guarantee you, the truck parking issue would be gone if people were willing to pay for it. It’s a cost of doing business that the truck stop industry has,” Mullings said. Across the country, the cost of funding improvements to the nation’s infrastructure also is top-of-mind, according to Dave Manning, president of TCW Inc. in Nashville, Tenn., and immediate past chairman of American Trucking Associations. “States are desperate for ways to increase their funding mechanisms. That’s because the federal government is not doing its job,” Manning said. When: Feb. 16, 1-3 p.m.; replay, Feb. 17, noon-2 p.m. However, Manning said he’s optimistic that leaders in Washington — including President Donald Trump — sense the urgency and will take action. One way to get the ball rolling, he said, is an increase in the federal tax on diesel and gasoline, which could fund repairs to the crumbling nation’s highways, roads and bridges. Manning said an extra 10 cents a gallon for fuel is a small price compared with what it would cost to repair a truck’s tire or suspension system if the vehicle ran through a deep pothole and spent part of the day in a garage. He added that now is a good time to increase the fuel tax because the price of gasoline is about 30 cents a gallon less than it was a year ago, and diesel is nearly a dime cheaper than the same period in 2018. The federal motor fuel tax is 18.4 cents per gallon for gasoline and 24.4 cents per gallon for diesel. The taxes were last raised in 1993 and are not indexed to inflation. 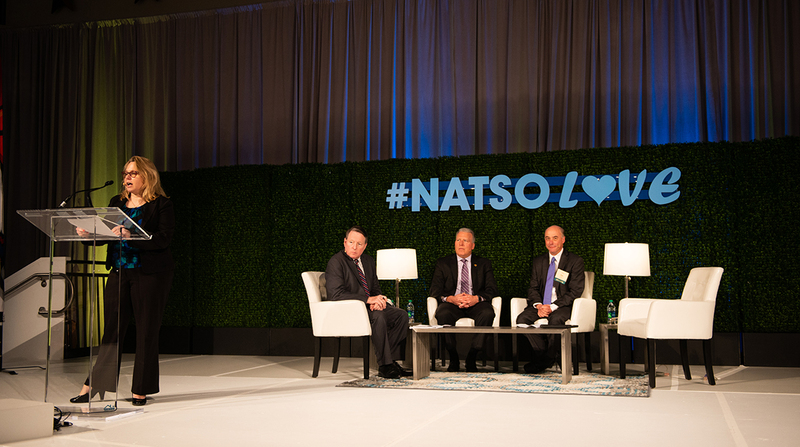 While drivers are out on the road, a retail expert told Natso attendees the truck stop industry should consider their competitive threats and focus on improving service, such as adding more and better food choices and upgrading the overall environment. This also could include better inside and outside lighting to make the facilities more inviting to the truck driving community and the general motoring public. And he had this advice for attendees who have been successful but face increasing competition in a strong economy.